Green beans are very nutritious and healthy vegetable. Green beans are members of the common bean family, Phaseolus vulgaris, and are a popular part of diets around the world. 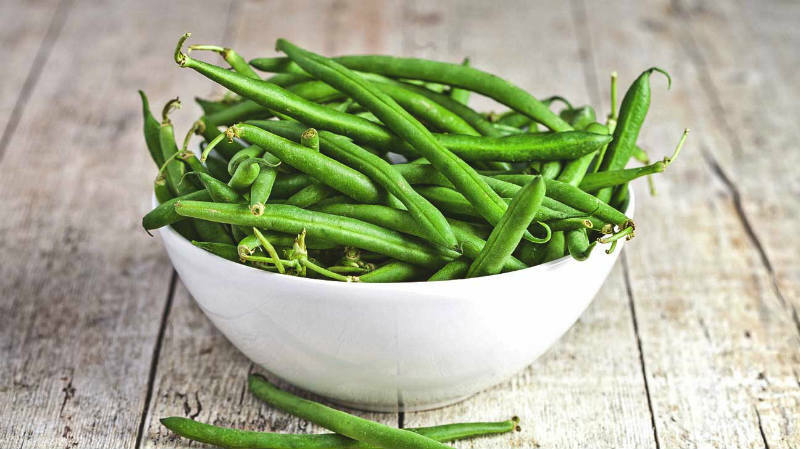 There are slight variations in shape in different areas of cultivation and green beans may be called many different things, including French beans, fine beans, string beans, or even squeaky beans, depending on where you are eating them. There are approximately 150 varieties of green beans that are split into two groups, bush beans and pole beans. Most prevalent varieties of beans in U.S. are: Burpee’s Stringless, Green Pod, Contender, Bountiful, Blue Lake, Purple King etc. Despite the variable appearance of the beans, their nutritional content and health benefits remain similar. Beans are low calorie vegetables (only 42 calories in 100 grams) and contain an average of 90 % water. Green beans contain many minerals and vitamins. In 100 grams it has 52 mg of calcium, 45 mg phosphorus, 0.7 mg iron, manganese, cobalt, nickel, zinc and many other microelements. Contain carotene (Provitamin A), Vitamin B1, B2, B6, C and E. Beans provide a wealth of nutrients in addition to being a versatile and delicious element in many different recipes! Some of the green beans health benefits include the reduced risk of heart disease and colon cancer, as well as an improved regulation of diabetes. They provide a big boost to your immune system and contributes to the elimination of harmful free radicals. Green beans contain 0.7 to 0.8% inositol, which strengthens the heart and regulates the metabolism. Green bean release the human body from toxic substances and are a natural diuretic that increases the excretion of urine. Also, green beans lower blood sugar levels. Promote Heart Health – One of the most important health benefits of green beans is improved cardiovascular health. Green beans are full of antioxidants and hence are a perfect heart healthy food. Antioxidants protect the heart from oxidative damage and control the level of fat in the blood. Fresh, young beans are especially beneficial for the heart. The fiber in green beans helps to reduce cholesterol levels. They also contain magnesium and potassium which help to balance blood pressure. Promote Bone Health – There are a number of nutrients, such as calcium, found in green beans that are integral in preventing bone deterioration and osteoporosis. They contain vitamin K, vitamin A, and silicon. Deficiencies in many of these compounds have been connected to increased bone loss, strength, and durability. Silicon is not the most common mineral to hear about, and significant amounts are relatively rare in most foods. However, green beans are a terrific source for silicon, which is a key element in bone regeneration and overall bone health. Treats Diabetes – These power-packed legumes have been shown to help manage and regulate diabetes symptoms in many patients. Certain studies have shown a definitive hypoglycemic influence on patients with diabetes. Diabetes is a condition that requires constant maintenance of blood sugar levels at a normal level so the body can perform necessary tasks. Natural regulators of diabetes are rare, and the connection of beans and similar plants to the control or early prevention of diabetes is great news for many people. Prevents Colon Cancer – Recent studies have shown green bean consumption to be beneficial for preventing pre-cancerous polyps that commonly lead to colon cancer. Many studies have tried to link dry bean intake to cancer prevention, with limited results. However, new evidence suggests that increasing dietary green bean intake can reduce the risk of cancerous adenoma recurrence and colorectal cancer. More studies are ongoing, but that linkage is very important. Relieve Pain – Green beans help relieve the pain of osteoporosis and osteoarthritis because they are full of manganese. The manganese will also help relieve PMS symptoms to help you feel happier! Aids Weight Loss – Green beans are high in fiber and low in fat and hence an ideal food for those on weight loss diets. Adding green beans to the diet ensures a healthy supply of important nutrients without any extra calories. Green beans can be added to soups and salads along with other nutritious vegetables. Green beans contain a lot of vitamins and many antioxidants; prevent from oxidative stress and prevent damaging of the cells as a consequence from free radicals; are good for almost all organs in the body.